Welcome everyone. 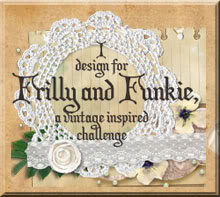 It's week two of the latest Frilly and Funkie challenge - Follow Your Muse! and the Funky team's turn to show you their projects for this one. Sue's instructions are to let your 'muse' wander free and see where it takes you. This could lead you down the route of journalling, altered art or trying something you've never done before. Don't forget, we do need to know what your inspiration has been and you can only enter four other challenges as well as this one. So where did my muse take me...? Guess who finally started scrapping/journalling my family tree!! Having talked about it, thought about it and asked for your ideas I finally followed my muse and got going. Having been utterly inspired by the work of Finnabair on her altered book family journal, and using the welcome suggestions from you guys to go A4 on this, I got some 'Pastel Paper' and got to work. The idea of this project is to tell current/future generations of the family about the ones from the past, setting their stories within the social context of the time - sort of like a history tour with a personal angle. The backing paper needed a swipe of gesso and modelling paste was used over a mask in a couple of areas. Further strips of paper, string, ribbon and lace were applied and then ink was rubbed in. 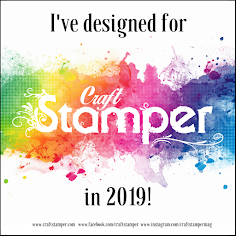 Finally I could add the pictures back in and include some stamping and other embellishments. You may be wondering what the list of rectangles are? Underneath are identical ones with the family lineage on to show how we are connected back to those being journalled. And the writing? Well that has been handwritten onto large tags - putting everything into a ring-binder means extra information can be added whenever it's uncovered. Oh, and I may add extra embellishments too:)!!! FABULOUS Jenny, just so creative and inspiring, I love the changes you have made. This is going to be an amazing keepsake. Wow you, this is going to be a fabulous thing for future generations of your family! I just love your attention to detail and every page has so many surprises: the more you look, the more you see! The comparison between the old and new is like night and day! Even I could be inspired to scrap by this. . . . . So many interesting things on these pages. It has made me think of scrapping and journalling in a completely new light. What wonderful colour choices as well. This is an inspirational idea, Jenny, I love your pages, they are fabulous. Can you hear me cheering Jenny? This is fantastic. You will be creating a treasured treasure that I am sure will be so loved by all your family. As you are creating it I am sure it is enabling you to process your thoughts and feeling too. I really believe that unless we engage with what we create we will not be satisfied. I look forward to seeing your next pages. Oh wow Jenny, this is amazing!!! 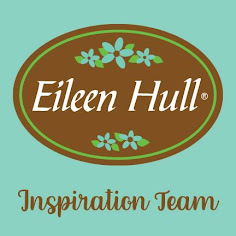 You have just totally inspired me! Love the muted tones you have used that fit so perfectly with the photos and all the embellishments fit perfectly without being over the top, - this is a master piece!! Oh and I love the idea of the journaling on the tags and everything in a ring binder, brilliant! It must have been such fun to make! Can you tell, I really, really love this!! Great idea to scrap your family history and stories - mine are on the computer which is even more boring!! Love your overall style and it's something you can add to when you have time or new information!! OMG! Jenny this is AMAZING!! the colours the textures it is truly wonderful and I love the idea of being able to add to it with the ring binder. Wow! Stunning. Love it,,,, it inspired me to create a new Seteampunk Set., I have just discover a new book to get picts....yeahhhh. This is an amazing way to record family history for the future generations - much nicer than a plain file full of just info. Love it. Oh this is "Spectacular" and with such a grungy feel. Love your "Muse" and this is so inspiring! Gorgeous! Wow, your muse has certainly lead you to an ambitious project! My hat's off to you for taking the leap on this one. 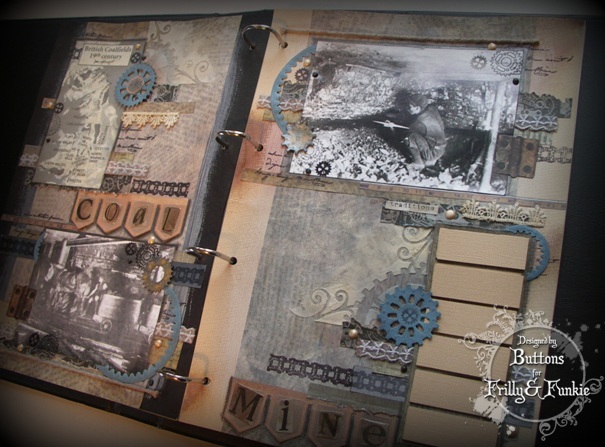 Love the layouts, the embellishments and all the fantastic journaling. You have created an amazing family keepsake! Super piece of work to showcase your serious talents for your first post for Frilly and Funkie. So excited to be designing alongside you! You have most definitely honoured your family in the most special of ways with those layouts. This is such a treasure already and the fact that you have allowed yourself the possibility for adding more information when unearthed is clever. What wonderful work!! Love how it all came together!! A really wonderful work, Jenny. You asked about the colours on the embossed hearts, it is Distress Ink Pad "Barn Door". OMGosh Jenny what an absolutely fabulous transformation of the pages. I love what you've done with them - gorgeous. I'm not a scrapper Jenny, but I can see that this layering is so gorgeous. Amazing result!!! Wow, that's a breathtaking piece of art. So much to see. Fantastic Jenny. I love your page layouts..............makes it so much more enjoyable to view. I purchased a scrapbook about 8 years ago for my one and only............. Thouhgt it would be a special gift for his 21st Birthday......... needless to say he will be 27 next month and its still not complete !!!! What gorgeous pages! A treasure with all your handwritten journaling. Love how you split the title and added the clusters of gears... wonderful! WOW....oh my creative word...this is beautiful! I love love love the vintage pages! What a labor of love!